No saris. No scents. No spices. No music. No lyricism. No illusions. Balram Halwai is a complicated man. Servant. Philosopher. Entrepreneur. Murderer. Over the course of seven nights, by the scattered light of a preposterous chandelier, Balram tells us the terrible and transfixing story of how he came to be a success in life-having nothing but his own wits to help him along. Born in a village in the dark heart of India, Balram gets a break when he is hired as a driver for a wealthy man, two Pomeranians (Puddles and Cuddles), and the rich man's (very unlucky) son. 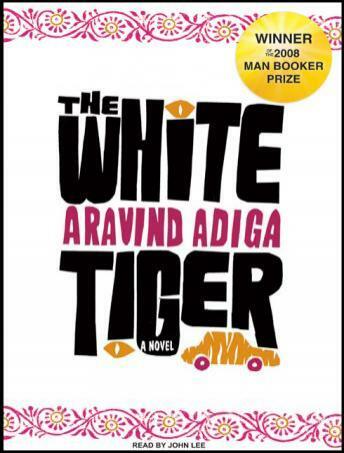 Through Balram's eyes, we see India as we've never seen it before: the cockroaches and the call centers, the prostitutes and the worshippers, the water buffalo and, trapped in so many kinds of cages that escape is (almost) impossible, the white tiger. And with a charisma as undeniable as it is unexpected, he teaches us that religion doesn't create morality and money doesn't solve every problem-but decency can still be found in a corrupt world, and you can get what you want out of life if you eavesdrop on the right conversations. very interesting book. i loved it, thank you very much audible for this. Something unusual here: a different read. Witty, clever, full of dark humor, well-paced, creatively-told. An interesting, if not flattering, look at Indian culture/society. Great stroytelling from a not often heard voice in India. I recently read The Namesake too...I guess The White Tiger is the opposite side of "filial devotion." A really well-written and informative book that gives one a fairly bleak view of Indian capitialistic society/democracy despite all their obvious "success." The legacy of caste systems, the intractable divides between rural and urban society, rich and poor, Muslim and Hindu, are exposed in an inventive way as the reader follows the development of a boy from the "dark" who forces his way to material success in modern India. I usually cannot stand these kinds of books. The reader has a thick accent and I am not very interested in Indian culture. But I could not hit stop on this book. I took it in from the car and listened when I was home between drives. The only problem is that I started thinking with the reader's accent. Though the author has an excellent style to write and is very imaginative; the book really does not get to anything at the end. It seemed like the author has worked very hard on the style of writing, but not on the content.